We’re counting on you joining us for a rain-free (or raining) First Friday. No matter what, we are ready for spring. Let’s look on the sunny side in case we’re faced with rain, it brings us May flowers. Visiting us on First Friday will hold some surprises. We anticipate introducing you to new businesses and rumor has it even the Easter Bunny will be making an appearance while searching for his sidekick Carrot. In addition, it is time to fill those Easter baskets! End your week by enjoying a delightful evening of shopping and dining in the Bellevue’s charming historic district. We look forward to seeing you IN VUE! Plan to join us in May for First Friday. Eat, sip, shop, meet new businesses, and enjoy! We'll have a gift of a butterfly-mix seed packet for you. You'll be able to create your own butterfly haven! Calling all artists and craftspeople for the 18th Annual Art in the Park. EARLY APPLICATION DEADLINE! APRIL 20th! Enjoy a discount on your booth fee! FINAL Deadline is June 16th! You can find your artist application here! Shop Local this Christmas Season! Make the Christmas Walk your holiday tradition! The day after Thanksgiving leaves us with fond memories, a refrigerator brimming with leftovers, and the beginning of the holiday shopping season. Start yours off with the 2-day Fairfield Avenue Christmas Walk from 10 am to 6 pm each day! It’s your opportunity to turn Black Friday, November 23 into a colorful day. And, for Small Business Saturday, November 24 we have all sorts of surprises for shopping “small.” Shop one or both days for a stress-free experience steeped with nostalgia, filling your heart with wonder and a chance to win fabulous prizes! You’ll find our independent businesses offer an eclectic mix of merchandise for everyone on your holiday list. Take a break at one of our eateries or brewery to revel in the ambiance of the day. Avoid the lines, the traffic, and all the hype driven by executives in some far away city. Stop, chat, visit, get your picture taken with Santa and Mrs. Claus on Schneider’s patio, weather permitting. In addition to our enticing festive ambiance, our prizes will make you not want to miss a thing. Each business you visit you’ll earn one chance to win prizes donated from each participating business valued at a minimum of $30! It gets better, there’s a grand prize of a sparkling piece of jewelry donated by Cleves and Lonnemann Jewelers. Are you curious about all the prizes? Keep your eye on Cleves and Lonnemann’s window and the ShopBellevueKY Facebook page to see what you have a chance to take home in time for the holidays! Shop the Fairfield Avenue Christmas Walk from the 200 to 700 blocks to see all your old favorites and many new shops. Enjoy the best of the “good ol’ days” where you and the holiday spirit are in the forefront. There’s more! We’re celebrating Small Business Saturday during the Christmas Walk with the assistance of American Express who recognizes small independent businesses communities bring character and vibrancy that provide a unique sense of place and a thriving economy. The Christmas Walk is an ideal time to shop your old favorites and discover those that will become your new favorites with the added bonus of chances to win great prizes. Plus, In Vue volunteers will have Shop Small goodies for you. Elf Marie arrive on Tom Rechtin, Sr’s vintage Bellevue fire truck at 11 am in front of Schneider’s Sweet Shop where you will find Santa and Mrs. Claus on their patio waiting to have their picture taken with you. You’ll also get a chance to meet the Special Olympic’s Polar Bear. He may entice you to take the Plunge in February. First Friday - Shop The Avenue - Yule Love it! The countdown is on! First Friday on December 7th falls two and a half weeks from Christmas. Don’t fret! Do yourself a favor and don’t leave town and get into the thick of the Christmas shopping frenzy. Instead shop The Avenue where you’ll feel the spirit of Christmas created by your local businesses and Bellevue Neighborhood Association neighbors that decorated all of Bellevue. Embrace our old-fashion charm and know you can find something for everyone on your shopping list with the added benefit of reinvesting in your community! Is there anything better than the sparkle of Fairfield Avenue at night during the holiday season offering stress-free shopping? Welcome to First Friday: Shop The Avenue – Yule Love it! beginning at 5 pm. It will be an evening “yule love” of shopping that simply cannot be found at the mall or big box store. You’ll find one-of-a kind gifts, hand-made items, delectable treats, and inviting eateries all delivering a festive ambiance and personalized attention. Shopping locally is a reinvestment in your community. Our local businesses contribute to not only what makes Bellevue the perfect place to call home; they also support our schools, churches, and organizations that create community. They are there for you and will continue be able continue to deliver with your patronage. There truly is something to the “shop local” dialog – it makes places special and sustainable. Stay in touch with all the holiday offerings by visiting us on Facebook at www.facebook.com/ShopBellevueKY. 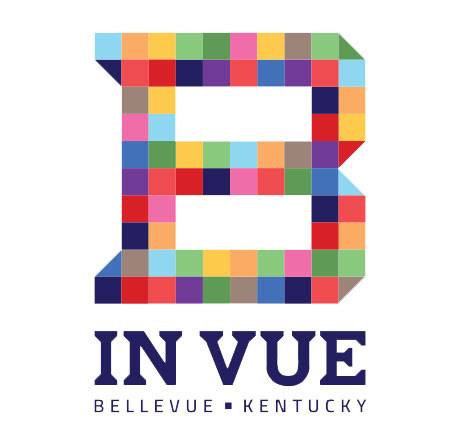 Every first Friday, In Vue hosts a fun-filled evening along historic Fairfield Avenue. The shops, restaurants, and other participating businesses are open late with many offering open houses and specials to compliment the evening’s themed activities.